Many times before a rectangle is finished building out there can be one last move back down to the center of the rectangle where support is found. If the bulls are truly in charge they could take this opportunity to rally gold up and through the top rail to complete the rectangle as a halfway pattern. If the bulls can muster up enough energy to take out the top rail the rectangle would have a price objective up to the 1445 area as shown by the blue arrows. At this point there is no way to know if we’ll see another reversal all the way back down to the bottom of the rectangle which would complete the 5th reversal point. It’s still a consolidation pattern at this time. We know that neckline is very hot by the many touches it has had in the last five years. If gold is finally ready to break out it will be interesting to see how it does it. Since there is such a well defined line in the sand we could see a big breakout gap as all the bears that have been defending that neckline are finally exhausted with none left to put up a fight. The line in the sand comes in at 1365. 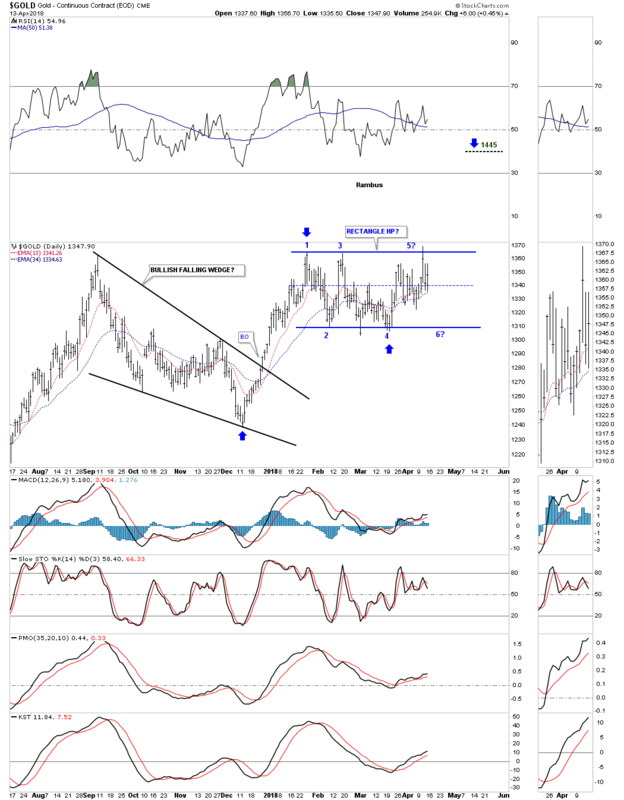 Wednesday Report… The US Dollar, What If Everybody Is Wrong?